Don’t even think about hitting the sand without making a stop for your beach day essentials at The Beach Store. Located on the edge of the A1A and Sadler Rd. roundabout, The Beach Store is perfectly located for your convenience. Forgot your sunscreen? Need to rent an umbrella and chairs? How about a paddleboard? If it has to do with beach fun, they probably have it covered at The Beach Store. Dean Root, the current owner of The Beach Store, purchased the store in 2011 and thinks it’s unlike anywhere else on A1A. 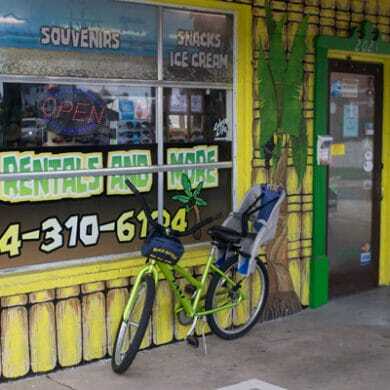 Beach Rentals and More, the rental service located inside The Beach Store, rents out chairs, umbrellas, bikes and boards to take your beach day to the next level. If you’re really looking for the executive treatment, the staff at The Beach Store has resort style umbrellas and chairs available as well. With tons of beach shops and stores on Amelia Island, Dean has a theory as to why The Beach Store has remained a favorite for locals and tourists. Make The Beach Store your first choice during your stay on Amelia Island! The Beach Store is located at 2021 S Fletcher Ave, Fernandina Beach, FL 32034. For more information, visit The Beach Store website or call (904) 310-6124.